Comments: BRAND NEW Still in original plastic wrap. Includes unopened CD-ROM. Over 1,000,000 satisfied customers since 1997! We ship daily M-F. Choose expedited shipping (if available) for much faster delivery. Delivery confirmation on all US orders. Ensure success using basic office procedures, Enhance professional development, and Build greater confidence Learn the skills that make every office worker a communication linkin person, over the telephone, via computer, and in writing: How to End Your Day Section: Prepare for practical functions of the workday. Online Information Services, Service Providers and Browsers: Make your job easier. Electronic Conferencing: Choose the right communication tool. 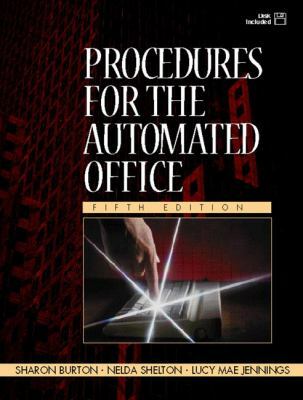 Enhance Your Skills Action Planning Surfing the Net Basic Skills Workshops Projects, Activities, and ApplicationsBurton, Sharon is the author of 'Procedures for the Automated Office' with ISBN 9780130254313 and ISBN 0130254312.